These are numeric, so I cannot figure out what my problem is. Any help would be greatly appreciated. Have you tried replacing cn[, 6] with as.numeric(cn[, 6]) ? I also ran into the same problem as sousuffer. But as you mentioned, I change the "genomdat = cn[,6]" into "genomdat = as.numeric(cn[,6])" and the same with maploc. The problem has been solved. By using the as.numeric I have tackle the error problem of "genomdat must be numeric". But after using the as.numeric, my results are very strange. The "seg.mean" value are all like several hundred, while I saw that other's result that this value should be around -3 to 3 or something like this. Do you have any suggestions that I can do to get a proper seg.mean value. 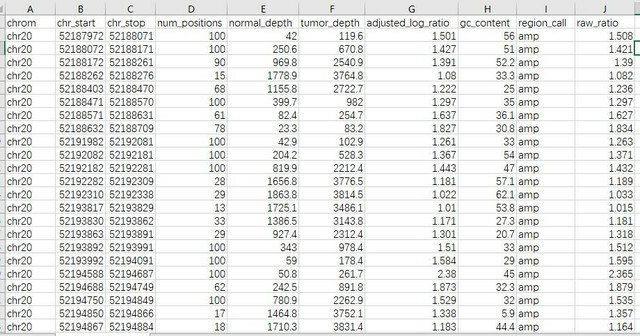 without seeing any of your data, there's really no way to tell, but one thing that jumps out is that you've replaced as.numeric(cn[,6]) with as.numeric(cn[,7]) Are you sure you're extracting the right columns? 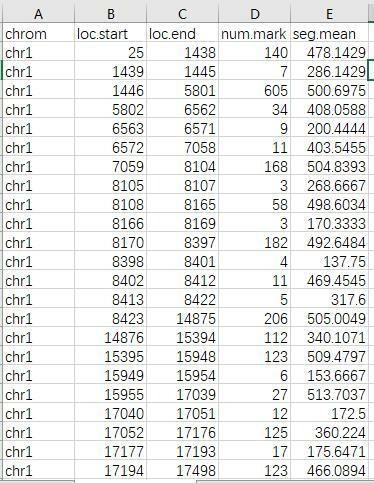 As you can see that the seg.mean column value are several hundred. I'm guessing the first line headers are messing this up? GISTIC 2.0 run of COSMIC CNA data?